NH Collection Amsterdam Grand Hotel Krasnapolsky. Rates from EUR145. NH Collection Amsterdam Grand Hotel Krasnapolsky is a luxurious 5-star hotel and conference centre that located in the very heart of Amsterdam city overlooking Dam Square. Being the largest 5-star hotel of the Benelux countries, it boasts impressive guest accommodation types and a wealth of modern facilities to suit any needs of both business and leisure travellers. 468 guest bedrooms and 6 Junior Suites are complemented by a diverse array of restaurants, bars and public spaces. A fusion of the old and new prevails in both styles of food and interior decor. The guests can sample traditional Dutch cuisine in the extravagant surroundings of the historical Winter-Garden and monumental Brasserie Reflet and enjoy the Middle-Eastern delicacies in the Bedouin restaurant. The comfortable lounge with birds-eye view of the Royal Palace offers a leisurely space to relax. Grand Hotel Krasnapolsky has created its own unique "Village on the Dam" and even possesses its own landing dock for boats. As you step out of the hotel you can enjoy the strolls round the stunning architecture of The Oude Kerk and Beurs van Berlage or walks along the path of the stars at Madame Tussauds. Exceptional comfort and high-standard service are offered to all guests of this lavish hotel; the guests' satisfaction is paramount for its staff. From the moment we arrived to check in at 0900 we were well looked after, WE had a beautiful meal in the Restaurant for Valentines and it was amazing. We would like to stay here again hopefully very soon. There was nothing to dislike all perfect. Lovely clean room,excellent breakfast,very helpful friendly staff,great location. Great location. In the very centre! 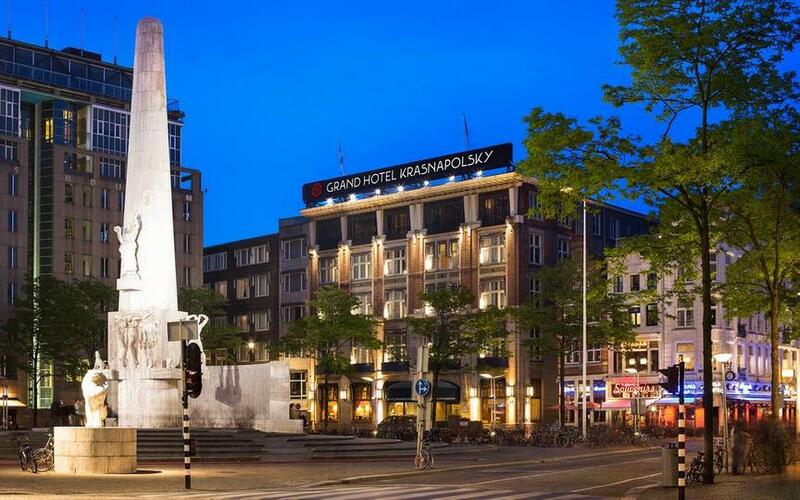 Making your reservation in NH Collection Amsterdam Grand Hotel Krasnapolsky is easy and secure. Simply select your dates of stay and click on the “Check Rates” button to submit the form.